The secret to our success is in the way we tend our 90 hectares of winery owned vineyards. 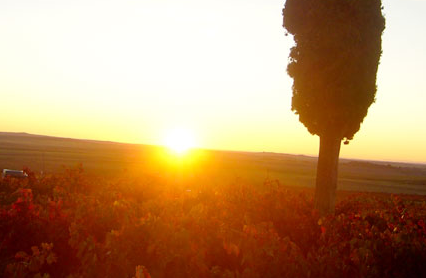 Tempranillo or Tinta del Pais is spread throughout the area and is famous in the region. We adore giving our wines a touch of Cabernet Sauvignon or Merlot. Our entire crop is picked by hand and harvest usually begins in the first week of October although this varies each year. We keep our yield low with some plots producing only 1,000 kilos per hectare with a maximum of 5,000 kilos per hectare. Together with the green pruning and other skilled methods that respect the environment, our wines have a personal touch of intensity and elegance. Looking to do something unique and different, but staying loyal to the traditions of local winemaking, our wines constantly improve in structure and balance. We avoid excessively long periods in the barrel with importance being paid to the final product in the bottle. The delicate process of aging in barrel is perfected and expertly controlled with French and American Oak barrels whose porosity and toast are specially selected before their production. These barrels enable our wines to rest and develop slowly in a tranquil atmosphere allowing them to age and evolve elegantly.